Which Minipack Shrink Wrap Tunnel is Right for you? The Tunnel 50 is a shrink-wrap machine that effectively packages food products, pharmaceuticals, software and other merchandise. The products are fed into the tunnel by a conveyor belt which has an adjustable height and has self-rotating rollers coated with stick-proof silicone. The controls on the Tunnel 50 are digital with 9 selectable and customizable programs, enabling it to handle most shrink film and packing tasks. The Tunnel 50 Twin Shrink Wrap Machine is a high output packaging machine that can wrap at amazing speeds of 80 pieces per minute. Each chamber is well insulated and features its own controls to set each one independently. The conveyor can also be adjusted to match the height of the merchandise and the exact speed for optimum wrapping. Use it to simultaneously wrap DVD’s in one chamber and books in the other. It doesn’t get much more efficient and practical than the Minipack Tunnel 50 Twin Shrink Wrap Machine. The Tunnel 70 is an effective shrink wrap tunnel that packages various types of merchandise in a protective film. 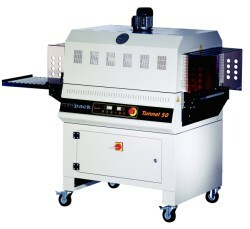 The Tunnel 70 is a durable, high-volume shrink wrap machine. This machine features an adjustable conveyor with silicone covered rollers feed merchandise through the tunnel. The digital controls feature 9 customizable programs, enabling it to alter the tunnels temperature and conveyor speed to handle most shrink film and packing tasks. These Minipack Shrink Wrap Tunnels feature a manually regulated conveyor height, a digital display with 9 storable programs, and an exit roll conveyor. If you have any questions or are interested in purchasing the Minipack Shrink Wrap Tunnels, visit us at SpiralBinding.com. We have great pricing on a full line of L-Bar Sealers and Shrink Tunnels. Call us at 1-800-631-3572 for more information!